Download the full brief here. The recently signed Cessation of Hostilities (CoH) agreement offers no respite, as it was violated barely 48 hours after its signature and frequently thereafter. These violations eclipse hope for injecting the confidence measures required to make IGAD’s High Level Revitalization Forum (HLRF) a viable endeavor. The ultimate outcome could result in upending the entire peace process and plunging South Sudan into even deeper and wider conflict, exacerbating the already dire humanitarian situation in the country and imperiling the region’s security. On the eve of the African Union Heads of State Summit, the central problem facing South Sudan’s peace process is its complete lack of leverage over the warring parties, who no longer take international threats and pressures seriously. Since the conflict’s 2013 start, the African Union has issued 13 statements that threaten action against violators of any of the truces in effect the past four years. Similarly, IGAD issued seven statements threatening consequences over the same time period. However, the African Union to date has not imposed one solitary consequence on any spoiler, thus undermining its condemnations and threats in response to horrific violations on the battlefield and continuing obstruction in the negotiations. As a result, the spoilers continue to violate cease-fire and peace agreements, showing no meaningful inclination to pursue peace. Thus, the next step is rather clear. 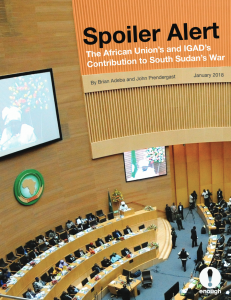 It is time for the African Union to impose specific consequences on South Sudan’s spoilers in the form of asset freezes, travel bans, anti-money laundering investigations, an arms embargo, and other measures that demonstrate Africa’s seriousness about peace in the continent’s newest nation. Such a move would provide essential leverage to IGAD’s HLRF and at least give it a chance to begin to press the parties for compromises at the negotiating table and a reduction—if not an end—to the frequent violations of the CoH agreement. The Ceasefire and Transitional Security Arrangements Monitoring Mechanism (CTTSAMM), a body authorized to monitor compliance with the CoH, has recorded CoH violations by troops from the government led by President Salva Kiir and the armed opposition under the leadership of Riek Machar, in multiple locations across South Sudan. In these violations, women, children, and the elderly have been killed. Both the government and the armed opposition deny their role in these violations and have accused each other of violating the CoH. To end this charade, the African Union should levy sanctions against leaders with command and control responsibilities on both sides. In this regard, the chief of defense staff for the South Sudan army, Lt. Gen. James Ajongo, should be held responsible for the actions of his troops. Similarly, the SPLM-IO’s chief of defense staff, Lt. Gen. Simon Gatwech Dual, should face further sanctions, in addition to sanctions imposed on him by the U.N. Security Council in 2015. Beyond these two figures, other military and political officials who share decision-making responsibilities with Ajongo and Gatwech should also be subject to targeted sanctions, visa bans, and investigations into money laundering through regional banking institutions. And to be clear, sanctioning one or two people every six months will have no impact on the warring parties’ calculations. For leverage to be built and pressure to be meaningful, entire networks around these key officials need to be sanctioned, and a number of them at once to demonstrate seriousness of purpose. “Network sanctions” are utilized in other higher-priority global crises, but rarely in Africa and almost never in support of peace. The African Union would make a bold statement in support of peace should it impose network sanctions on key leaders and their commercial facilitators inside and outside South Sudan, as these leaders who are destroying the country through war are the same leaders who are bankrupting it through their looting of state assets and natural resources. In support, IGAD should continue to encourage the African Union’s Peace and Security Council to levy sanctions. The current process is fraught with many obstacles, not least among them the competing geopolitical interests of the IGAD countries themselves. Regional contests over a variety of factors ranging from border issues, sharing of water resources, and support for opposition groups threaten to impede progress at the talks, as member countries play out their differences to secure leverage and influence. There is no easy answer. Removing IGAD from the negotiations would simply enhance the spoiler status of its member states. Therefore, the African Union should establish a process to urgently review the existing negotiations at the scheduled February 2018 IGAD-led HLRF talks. The African Union and United Nations should consider how their dual roles can be enhanced in the process to help lend gravitas to the negotiations and counter in part the competition among IGAD states that is so damaging to the peace efforts. CTSAMM’s ability to monitor and verify compliance should be strengthened to include the use of surveillance technology. Monitoring and verification responsibilities should be expanded to include civil society partners to augment and amplify oversight on multiple fronts. The African Union should consider availing resources for civil society efforts to engage and sensitize the warring factions on compliance responsibilities including consequences for non-compliance. Finally, an enhanced monitoring capacity should be directly linked to an African Union committee tasked with working to impose immediate consequences for further observed violations by any warring party.